You can also now add social media links to your emailed updates, allowing you to easily share your favourite news and blog posts. You'll find these options in your Account Settings page. If you've not got an account yet, then sign up! Hi. Could you please give some more explanation around the ability to add social media links to your emailed updates. 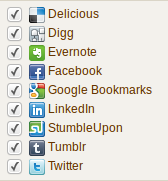 I selected the Evernote and Twitter options...but this didnt seem to do anything. I was expecting that it would ask for login details and authorization etc. What i want to be able to do is get Tweets from Twitter (RSS feed) automatically into Evernote (via email). Is Blogrottr able to perform this? Thanks. Hi @Paris93 - Enabling these options will add a row of icons to the bottom of an email, I've updated the post to hopefully be a bit clearer! You can email things into Evernote, so you could perhaps try subscribing to the twitter feed with your Evernote email address. Any chance of adding one for Pocket (http://getpocket.com/)?